Luxury Villa By The Beach, Athens; Eot Certified; Solar Pool. Luxurious vacation villa; incredible views, close to Athens and the beach. WiFi, 4/5 bedrooms, 3 1/2 baths,450 sqm living space. Solar operated pool. 3 bedroom home with mountain view. 'Agape' is a modern greek cottage licensed by the Greek Tourist Organization (GTO) in the Pelion peninsula rising from the Aegean Sea with outstanding natural beauty and many activities to offer. Luxury Villa Dion: Your Stairway To Holiday Heaven! A beach villa in the area of the Temple of Poseidon in Sounio located next to a sandy beach. The villa sleeps up to 8 people and is located on a 10,000sq. m. land. Athens Riviera, Lagonissi Blue Coast beach, two levels private deluxe villa 500 m2, very close to sandy beaches with a panoramic and unobstructed sea view, beautiful sunsets and a big swimming pool. 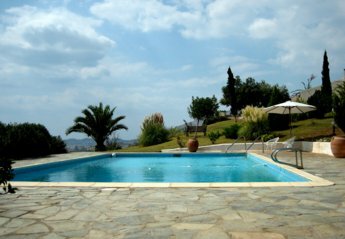 Α countryhouse 65m2 with a 400m2 garden only 50 minutes from Athens and 40 meters from the sea. This stunning, modern house is located in the centre of the popular town of Koroni in the southern Peloponnese region of Greece. Sleeping up to 6 it is superbly located for town and beaches.